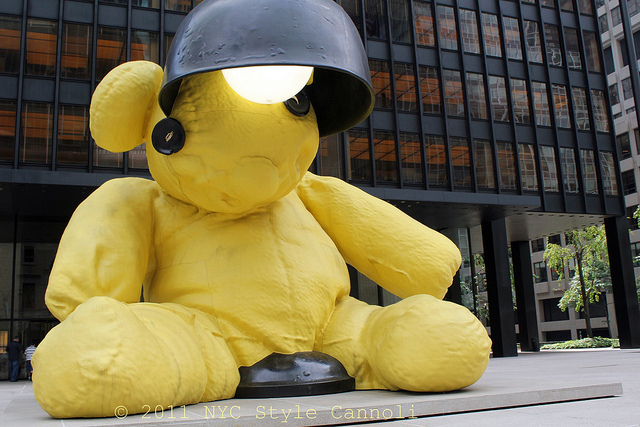 Photo Gallery Tuesday "Giant Teddy Bear on Park Avenue"
Upon walking on Park Avenue, I came across Christie's Untitled (Lamp/Bear) by Urs Fischer which sold at auction for $6,802,500.00 in May of this year. Executed in 2005-2006. This work is number one from an edition of two plus one artist's proof. On 11 May 2011, Christie’s offered Urs Fischer’s Untitled (Lamp/Bear), as a highlight of its Post-War & Contemporary Art Evening Sale. The sculpture went on to realize $6,802,500 and set a new world record for the artist at auction. Christie’s partnered with the Seagram Building, the architectural masterpiece by Mies van der Rohe in midtown Manhattan, to arrange for an outdoor exhibition of the sculpture on the building’s plaza so that the city at large might enjoy this special glimpse into the creative genius of one of today’s most provocative young artists. Admired for his playful and provocative works, Fischer’s towering teddy bear functions as a universal symbol of childhood memory and evokes a multitude of interpretations and emotions, from wonder to nostalgia to tongue-in-cheek humor. Fischer – whose first name is derived from the Latin word for bear – has said the sculpture’s slumping form, button eyes, and fuzzy yellow texture were inspired by his own much-loved teddy bear. The added touch of a working bedside table lamp above the figure’s head is functional, so that the bear can be lit up at night, creating a true spectacle. To create Untitled (Lamp/Bear), the artist sewed together a teddy bear that was approximately one foot tall and scanned the object using a 3-D laser. He then used the scan to generate the working drawings for a stainless steel interior framework and cast-bronze exterior. The finished bear with its exterior coating of paint and lacquer weighs 35,000 pounds. He is located in front of the Seagram building at 52nd Street and Park Avenue......... A few people came by with children but a guard standing by quickly said, No Touching, and they were not too happy. I would love to know where the buyers are going to store this Teddy, wouldn't you? He is on display until September 30, 2011. Thank you for showing this bearlamp. Also nice that there are measures in meters so it really is a big bear. Cut!! This bearlamp is awesome! !